I loved the way it turned out for this wedding details photograph. Your wedding day pictures should be simple and elegant just like this image. This photo seems easy, but I've actually put a lot of thoughts into this. In order to show the details of the dress, I wanted to utilize a sufficient amount of window light. 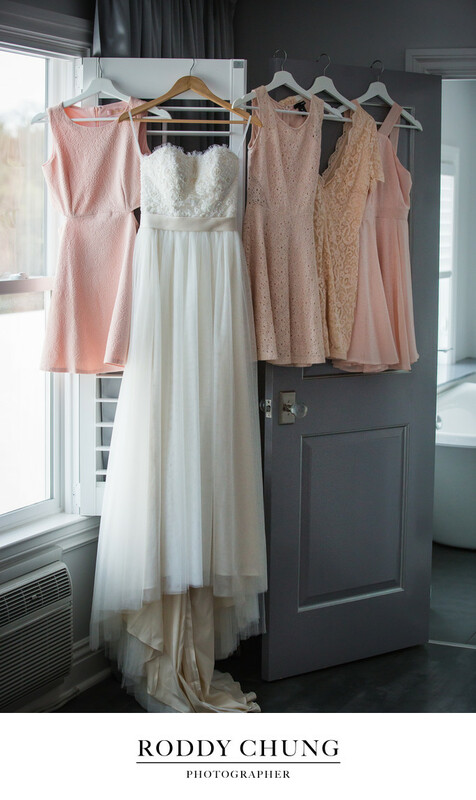 And at the bridal suite of Willow Heights Mansion, there weren't plenty of light source across the whole room, so I arrange the gown and the dresses by window. There were 4 bridesmaids dresses here. Usually somebody would position the wedding dress in the middle with 2 dresses on both sides, but I purposely move the wedding dress one closer to the window so the natural light can be on the main subject. Furthermore, you may have heard of rule of thirds when composing for a photograph. Such arrangement of the dresses also beautifully serve the purpose of such composition. This is something I've wanted to to do for a while and I was so glad that I finally did it. To learn more about this destination wedding in California. Click here to read the blog post!